After saving the world in medieval times (not to be confused with Medieval Times), Army of Darkness hero Ash Williams was given a potion to drink that would allow him to sleep the years away, reawakening in his own time. What happened next depends on where you live. Ash is a shotgun-toting, chainsaw armed department store clerk transported back to England's Dark Ages to battle an army of Deadite soldiers for possession of the Necronomicon. Trapped in time. Surrounded by evil. Low on gas. In the European release of the film, Ash drank too much and woke up in a post-Apocalyptic future in which the world had been overrun by Deadites. In the US, however, his adventures weren't quite over. We catch up with him in the modern day, back at his job as a store clerk and telling his story to his fellow employees. Of course, since he screwed things up in the past, the Evil Dead are soon attacking the store, leaving Ash to show just what kind of hero he is. 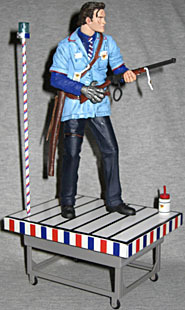 When McFarlane Toys got the AoD license back in 1999, their message board was split between those who wanted the torn blue shirt and chainsaw and those who wanted the blue sweater and metal hand. His S-Mart uniform was barely even on anyone's mind. This isn't one of Ash's more iconic looks, but that's okay - it's still from a memorable scene. Ash stands just over 6¾" tall, because he's posed with a slight hunch - if he was standing up straight, he'd probably be just over 7". The figure is obviously intended to be displayed in his one pose, but NECA gave us enough articulation that we have options. Ash has a balljointed head, balljointed shoulders, swivel elbows, balljointed wrists, a swivel waist and one swivel joint in his right thigh. How unexpected! Yes, in his intended pose, he looks like he's playing air guitar, but the nice joints mean you can (almost) have him stand there like a normal schlub. Or maybe a shemp. Craig Campbell and Jason Frailey share credit for the sculpt, and they've done an admirable job. The face looks much more like Bruce Campbell than the Movie Maniacs Ash did. I want to say that it looks a bit young - like Evil Dead Ash rather than Army of Darkness Ash - but that may just be because I haven't re-watched the film in a few years. There's no question at all as to who this is supposed to be. The profile isn't quite perfect, but it's darn good overall. Ash is wearing his S-Mart uniform: dark pants, dark blue shirt, striped tie, and a light blue shirt over top. Proving that his crazy weekend at the cabin wasn't just a hallucination, his right hand is the big metal gauntlet he rigged up 700 years in the past. He's wearing his S-Mart nametags, and has a rifle holster slung over his shoulder and cinched around his waist. Because, again, the Deadites. When the S-Mart was attacked, Ash leapt into action. Literally. Knocked into the store's gun display, he grabbed a rifle, climbed onto the counter, then jumped onto a rolling cart that was full of the day's Blue Light Special (S-Mart water bottles) and rode that cart into battle against a surprisingly spry and gymnastic old crone. Because NECA gives fans what they want, the figure includes all that stuff. Well, other than the crone. Gotta draw the line somewhere. 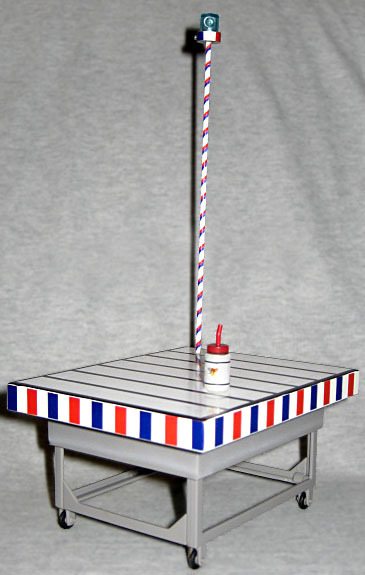 The cart is 4¾" by 3¾" and 2½" tall. All four wheels turn, and there's a pole in the corner with the blue light on top. There are two footpegs on the top, to keep Ash standing (he really needs them, too), and a single water bottle you can place wherever you like. The rifle is decidedly different than the shotguns the previous Ashes had. It looks nice, and fits in the figure's hands fairly well, but it isn't perfect. The main flaw? Though the sculpt suggests the gun is in the middle of being cocked, you can't get Ash's giant metal fingers in there to do it, so he's just left holding a half-cocked rifle. It still looks cool, though. That white thing hanging off the barrel, by the way? It's supposed to be a pricetag on a string - that's just a very difficult thing to sculpt. One problem with the accessories? NECA's use of stickers rather than paint for so much of the color. The tape holding the pieces of the cart in place, for instance, can rip the stickers off, leaving you to carefully re-apply them. There must be some kind of cost-saving measure intended with the decals - it certainly can't be because they really think it's a better solution. Getting the first Ash figure was a triumph of persistance and dedication, since McFarlane Toys famously said the figure would never sell. When Ash was unveiled at Toy Fair 2000, he was easily the big attention-getter, and when Movie Maniacs 3 was released that fall, he was the first to sell out. Ash, in short, was a raging success, and any smart company would have moved to capitalize on that. Oh, they re-released the same figure in a two-pack with a Deadite, and they gave us Evil Ash, but then they ground to a halt. 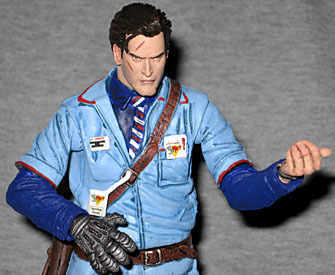 Fans kept asking for more Ash, and the secondary prices remained high on all the Army of Darkness toys, but Todd for some reason stopped going to that well. Thankfully, NECA eventually came along to pick up the discarded license, and in two years has already tripled the Ash selection available. There are still plenty more they could make before having to duplicate McFarlane's, too.